Ho ho ho, Merry Christmas! 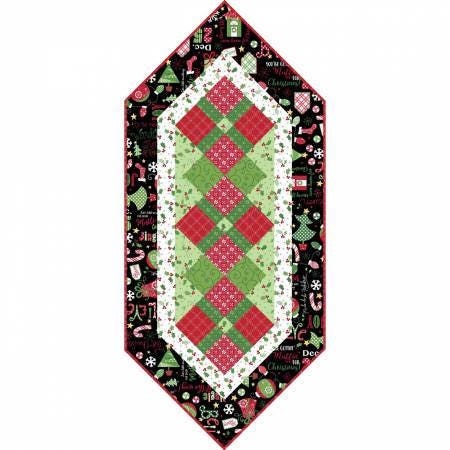 Jingle All The Way kit is a delightful table runner kit which includes everything you need to complete this wonderfully festive table runner. In this kit you will receive 100 percent cotton fabric for the quilt top, binding and pattern. Don't miss out on this beautiful holiday table runner, perfect for a gift. You will find colors of black, shades of red, green and sparking white. All fabrics from The Quilted Nursery are cut directly from the bolt. We now offer fractional yardage cuts for your ease in shopping. All shipping overages will be refunded upon shipment of fabric. Keep a smile on your face and fabric in your hands!